The Iron Dome missile defense system was deployed in the greater Eilat area Wednesday, as part of an IDF survey meant to test the system in various areas across Israel. The Iron Dome battery in the region was deployed and calibrated following several delays over the past few months. The decision followed a security assessment by the defense establishment. Three weeks ago, the remnants of a Grad rocket were found just north of Eilat. Security forces were scrambled to the area following reports on an explosion, which luckily caused no harm. The IDF believes that the rocket was fired by a Sinai-based terror group. 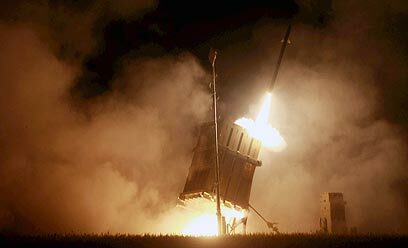 A military source told Ynet that following the recent cases where terror groups fired Grad rockets at the greater Eilat and Ovda areas, the IDF decided not to take any chances and calibrate the defense system to the area's unique topography. The system's deployment was coordinated with local comminutes and the City of Eilat, in order to prevent public panic. The IDF has been training in the rapid deployment of Iron Dome, as part of immediate-response scenarios in the south. Iron Dome's deployment near Eilat was similar to its recent temporary deployment in the greater Tel Aviv area, a military source said. See all talkbacks "Iron Dome deployed in Eilat region"